Fall weather is upon us, which means that soon we'll all have the opportunity to leaf-peep until our eyeballs pop. Here's a round-up of the best fall foliage web sites and online resources for New England, including several state-specific foliage reports. It's hard to imagine a more comprehensive online resource than this bonanza of everything foliage related. A production of Yankee Magazine, the site features a county-by-county live fall foliage map for New England (and beyond), which includes user-submitted foliage reports and highlights foliage pictures in different locations taken within the past five days. The site also offers this great animation that shows the likely progression of peak foliage by date across New England, as well as beta on recommended foliage drives and the top 25 foliage towns in New England. Their mobile foliage app is a bit weak, though it does make it easy to submit your own foliage report and picture from the field. Regular state-specific foliage updates begin rolling out in early to mid-September. Here's where to find them. Maine's Department of Conservation breaks down the state into seven regions and posts weekly updates on current foliage conditions. You can sign up to receive these updates by email. Also check out their fun and easy-to-understand animated video, Maine's Autumn Magic: How Leaves Reveal Their Fall Colors. The New Hampshire Office of Travel and Tourism breaks the state down into seven regions and provides regular updates for each starting around mid-September. More text than maps or images, but their interactive map of likely foliage conditions by date is pretty useful. There are two excellent resources. 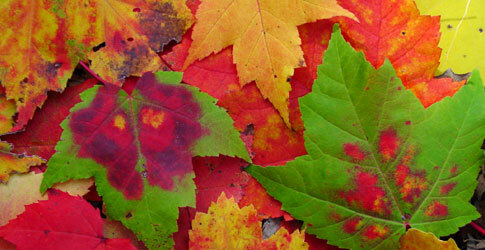 For the most recent reports, check out the Vermont Department of Tourism and Marketing's Fall Foliage Central site. For more in-depth information on everything Vermont foliage related, visit Foliage Vermont, which offers this excellent animation of foliage progression across the state, among other resources. For Massachusetts, a good resource is the foliage site from the Massachusetts Office of Travel and Tourism, where you can browse their interactive foliage map sign up to receive regular state foliage updates by email. In Connecticut, head to the fall foliage report from the state's Department of Environmental Protection, which identifies good scenic foliage viewpoints across the state.